That declaration was not made by myself or any other car aficionado you may know. It’s actually a lyric in a song called ‘Bad Girls’ by Sri Lankan rapper M.I.A. While I would take a manual transmission over an automatic no matter what the vehicle was, I especially live by this line when it comes to performance cars. But there’s a problem. Increasingly, more and more performance cars are not only being equipped with automatic transmissions, but a manual isn’t even an option. The reasoning behind it has a lot of do with stats; today’s automatics can shift quicker than any human being possibly could, they can be had with more gears than a manual and they’re more often than not more efficient. Not to mention, buyers of automatics consistently outnumber those of us who prefer to row our own gears ourselves. Personally, I don’t care about any of that stuff. It doesn’t matter to me if a transmission is better on paper; all that matters is how it makes me feel when I drive it. While I can recognize that automatics have advanced incredibly over the past decade or so, there’s still not much about them that I like. I find I have less control, despite the ability to still shift gears yourself, but more importantly, I find automatics tend to rob the car of any soul it may have had. Volkswagen’s DSG automatic transmission is agreed to be – by most – among the best automatic you can put into a performance car. I won’t argue that. But the amount of delight that I experienced when I was reading the specs for the Golf R tester was overwhelming when I read what transmission it was equipped with: six-speed manual. Aaahh! 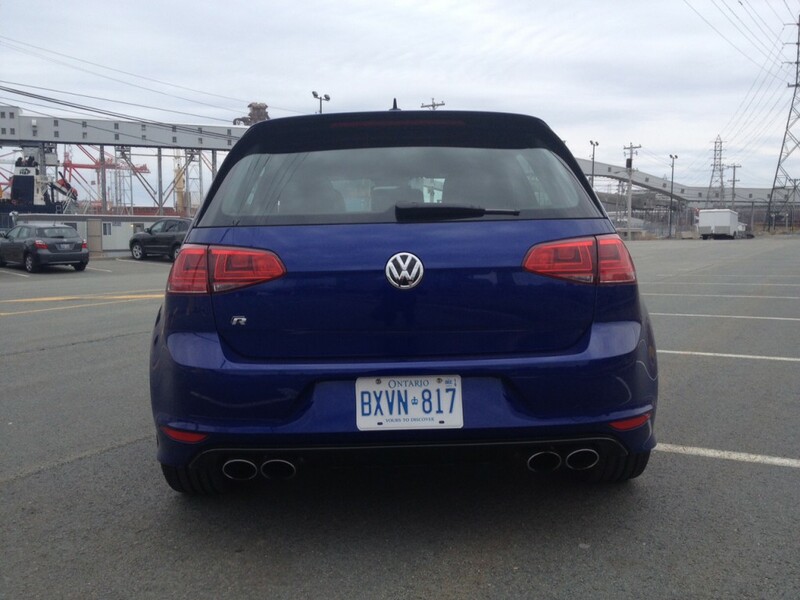 Not that I needed an excuse to be excited to drive Volkswagen’s most performance-oriented model. But there was an added amount of excitement for sure. Besides having a proper manual transmission, another thing I prefer in my performance cars is a measure of discretion in the styling. Volkswagen certainly delivers on that front in typical German fashion. Perhaps the flashiest part of this car is the rather nice looking 19 inch wheels surrounded by rubber which looks painted on. Other indications that you didn’t buy a standard-kit Golf include the quad pipes out back, unique daytime running lights, the Lapiz Blue paint (only available on the R) and, of course, the R badging. In fact, it doesn’t even get Golf badging. Overall, the look works well for me and my preferences. It’s handsome no matter which angle you view it from. Inside, restraint is the name of the game as well. There’s nothing particularly fancy going on with the styling, which includes a conventional centre stack which houses the touch screen which responds to commands rather well. Though its layout is logical there are clearer, crisper looking screens out there. This is where the image for the back-up camera is housed and this is a disappointment as well. The image is dark and unclear and while there are guidance lines, there are no trajectory lines. The wheel itself not only looks the part, but it feels rather nice in your hands. It has nice grips for your hands and it’s thick, but not too thick. Likewise, the seats feet fairly perfect too with enough side bolstering to keep you in place, but not so much that it digs into your ribs. They are supportive and comfortable. 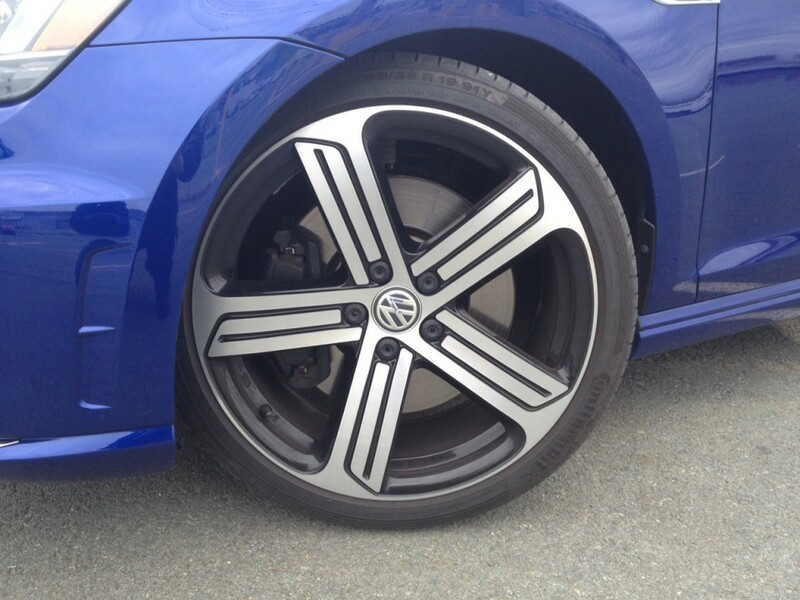 Materials are high quality, as you’d expect from a VW. The only real disappointment about the interior is the lack of space in general. Most drivers of any stature or height would likely be able to fit comfortably, but rear seat legroom is a bit lacking as is cargo room, which is a bit disappointing considering it’s a big reason why people opt for hatchbacks over sedans. 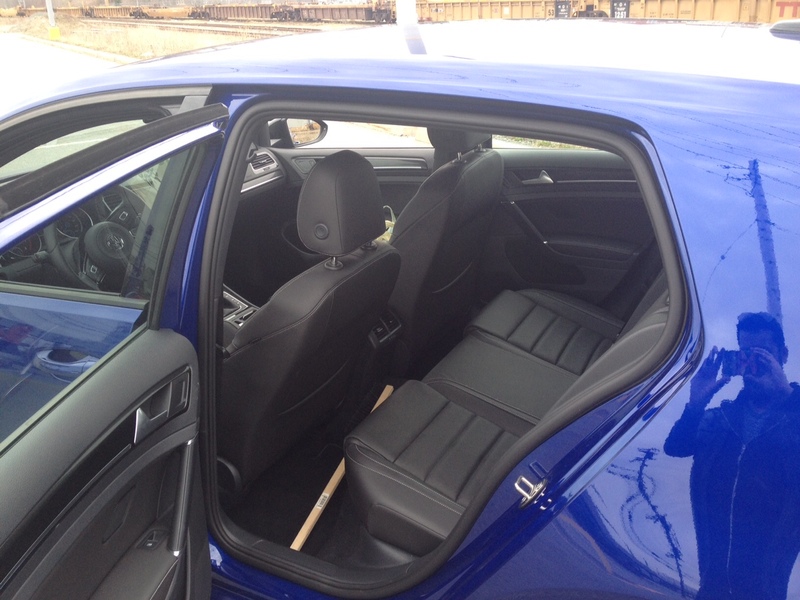 The rear seats do of course fold, but then you lose the passenger space in the process. 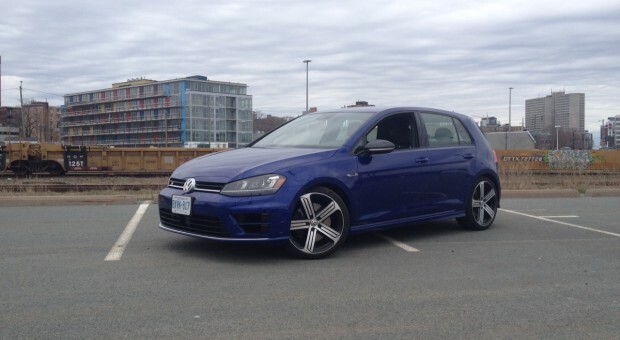 This problem could be remedied if Volkswagen just went ahead and made an R version of the Golf wagon. Hint hint, nudge nudge. This is where the magic happens. 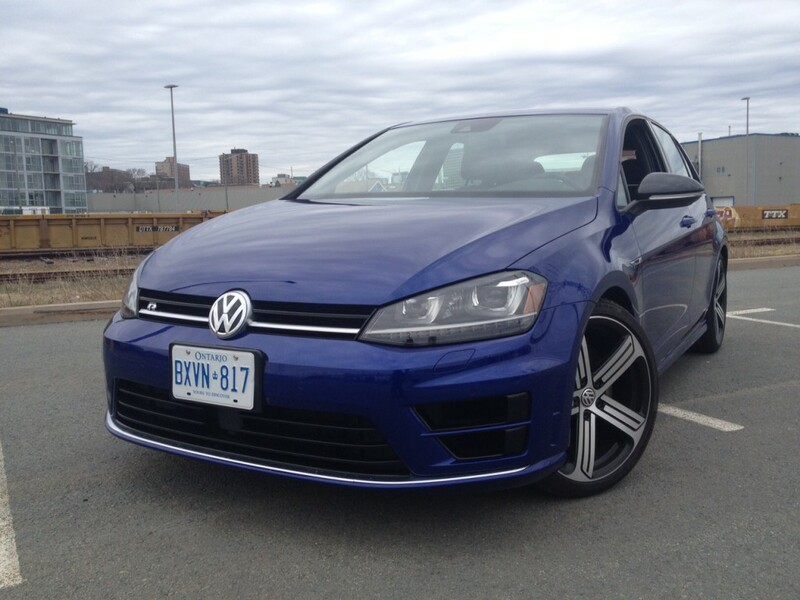 The Golf R gets a 2.0 litre turbocharged 4-cylinder which produces 292 horsepower and 280 pound feet of torque mated either to the aforementioned six-speed manual or a DSG automatic. Now, while this amount of power will be plenty to satisfy most enthusiasts, it should be noted that the Ford Focus RS will be landing on our shores shortly with a rumoured 345 horsepower. Then there’s the Honda Civic Type R which also can’t come to our shores soon enough. Having yet to experience the RS or the Type R, it’s difficult to say whether the extra money for more power is worth it. 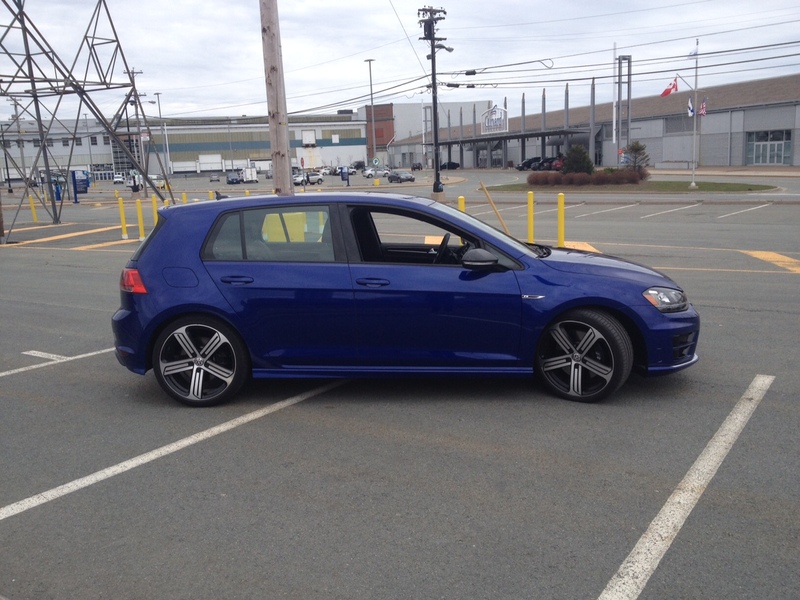 While more power is rarely a bad thing, I never found myself wanting for more at any time during my week with the Golf R. I might even call it the perfect amount of power for a Golf. I started this review off by gushing about manual transmissions for a reason. This engine/transmission combo is fantastic. Sure, the shifts aren’t the most refined – one might even describe them as clumsy at times – but there really is nothing quite like that feeling of grabbing the beast by the scruff of the neck. The best part about this engine/transmission combo is the readily available power in almost any gear. Just to test ability of the power band, I was able to start from a standstill from 5th gear without issue and without having to downshift to get more power which is very impressive. Admittedly, there is some slight turbo lag at take-off (in first gear, that is) but the Golf R’s ability to get off the line in a hurry is still admirable. 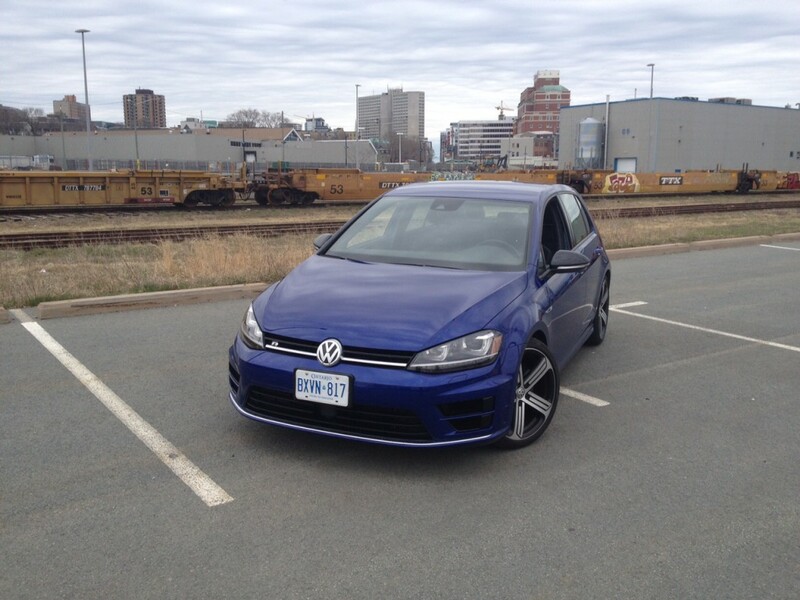 The Golf R has different driving modes and you might be surprised to learn that I kept it in comfort mode a lot of the time. That’s because the trade-off between comfort and handling is very minimal. In fact, it offers the best of both worlds by being able to adequately soak up bumps and imperfections in the road with minimal disruption to the cabin, all while being able to take a corner in a relatively flat and surefooted fashion. That confidence only grows in normal and track mode, but truthfully, for every day driving in the city, you’re better off leaving it in comfort mode. 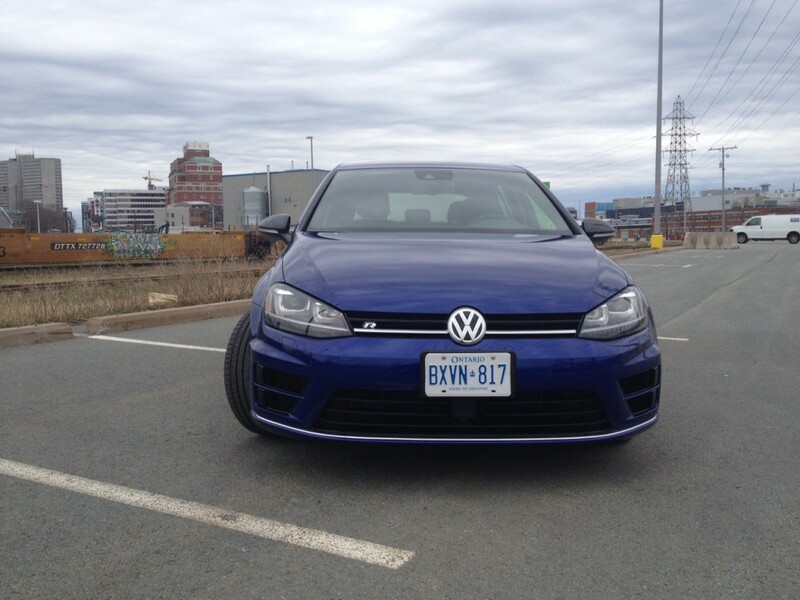 As you can imagine, the Golf R is a performer on the highway as well, delivering typical German surefootedness and a solid ride. It’s also typically German in the sense that you can easily catch yourself going well above the speed limit without even really realizing it, so be sure to keep an eye on that speedometer. The good news is that even if you tend to drive it like you stole it, the Golf R will still deliver adequate fuel efficiency. Officially, it’s rated at 10.9 L/100 kms city and 7.7 L/100 kms highway. In real world conditions, I returned an impressive 8.8 L/100 kms. The downside? 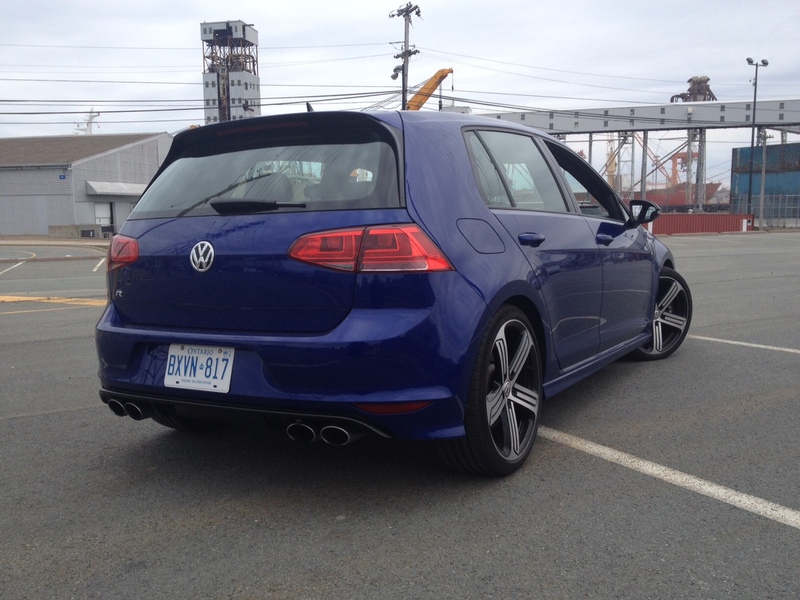 The Golf R requires premium fuel. I would imagine that you may be able to do even better with the DSG, or if you are lighter on the throttle than I was. But I also imagine that will be pretty hard to do considering the wonderful exhaust note. It’s been a long time since I’ve been able to drive a performance car with a manual transmission (my personal vehicle excluded) but I didn’t realize just how much I missed them. Sure, there are cheaper performance cars than the Golf R – the Ford Mustang or the Fiat 500 Abarth for example- but neither offer the practicality of five doors. Yes, the GTI can be had for much less but I’m not sure that I care. The difference in performance is noticeable and the added benefit of all-wheel drive is perfect for Canadian weather. It looks better, and is rarer also. But remember, I’m drawing this conclusion having yet to drive its immediate competition. The Ford Focus RS, Subaru WRX STI and the upcoming Honda Civic Type-R aren’t exactly known for being tame. All three can claim around the same amount of practicality to boot. But for now, this is undoubtedly the best vehicle that Volkswagen makes and, for now, it’s the most well rounded car I’ve driven in a very long time. Also, long live the manual transmission!